There are many reasons to be up in arms over food waste in America. It’s not just an environmental issue—it’s a moral and humanitarian one as well. 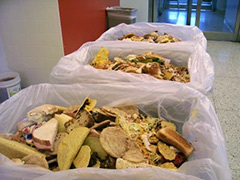 In addition to the excess methane that trashed food produces in landfills, consider global hunger and childhood obesity. A wave of guilt should come over anyone that wastes an eatable portion of any meal. The problem is especially applicable to the country’s popular restaurant chains and All-You-Can-Eat Buffets. In other words, restaurants should nix the Styrofoam to-go containers immediately. But, this train of thought is hardly limited to dining out. Family cooking could also stand to cut down on food waste. So, crack down on portion control at home, and package the leftovers for lunch at work the following day. Posted on October 24th under Pollution Reduction.